105 starters and 52 classified finishers. 17 stages (2 were individual time trials) with an average stage length of 218 km. Despite winning an incredible 10 stages, Learco Guerra carved out just a narrow 51-second victory over Francesco Camusso, mostly on the basis of his superior time trialing. Five-time Giro winner Alfredo Binda abandoned in the 6th stage after getting hit by a police motorcycle. The Giro stayed at seventeen stages, but the stages were somewhat longer. The overall length of this edition was 3,713 kilometers, making for an average stage length of 218 kilometers. The individual time trial was retained but made more civilized. Now there were two, one 45 and the other 59 kilometers long. A good helping of excellent Belgian and French riders were among the 105 starters. Perhaps the finest was Félicien Vervaecke, who would go on to earn a second place, two thirds, a fourth plus a King of the Mountains prize in the Tour. Demuysère was back and on top of his game, having won that year’s Milan–San Remo. The Italian contingent included Guerra, Camusso, Olmo, Piemontesi and Binda, who finished at Milan–San Remo buried in the pack, almost fourteen minutes behind Demuysère. While the race was long by 1933 standards, it wasn’t considered rigorous by contemporary observers. Its climbs inspired no awe and with the finish lines coming well after the peaks, non-climbers could get back on terms with the scalatori and then smack them in the sprint where lightweight climbers are generally prone to get a beating. One might reasonably think this was a race designed for Guerra, especially given the organizer’s demonstrable lack of love for Binda victories. Since Binda was particularly formidable in the mountains, this configuration removed some of the great man’s claws. Guerra was superb against the clock and he had plenty of clock to race against in this Giro. The first stage headed off to Turin. Francesco Camusso managed to slip his leash and beat the Guerra- and Giuseppe Olmo-led pack by 15 seconds. Guerra then took the peloton to racing school. First, he won the next two road stages. Then at the time trial in Pisa he went 41.127 kilometers per hour, almost two kilometers per hour faster than Binda had gone in the 1933 Giro’s time trial; this set tongues flapping. Guerra was in extraordinary form. Binda, who seemed to have suddenly entered the sunset of his career, completed the distance over two minutes slower than the Locomotive. Learco Guerra wins stage 2 in Genoa. Despite his stage-winning ways, Guerra had not yet carved out anything close to a secure lead. 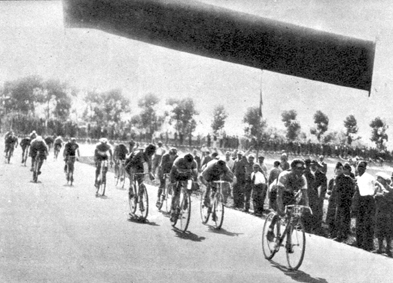 The independent riders seldom made a large impression on the Giro even though they generally made up about half of the starting pelotons in the 1930s. Unsponsored racer Adriano Vignoli did make his presence known in the seventh leg, however. Stage seven was a 339-kilometer trek crossing the southern Apennines between Naples and Bari. Vignoli raced solo for 160 kilometers, arriving in Bari 10 minutes 42 seconds before the pack. Adding in the one-minute bonification the stage offered, he moved up to sixth place, 4 minutes 5 seconds behind Guerra. The eighth stage was over the hilly southern country between Bari and Campobasso with another minute’s time bonus in play. Stage winner Vervaecke broke away with Giacobbe and Mara. Olmo followed in a little over six minutes later while Guerra was almost eight minutes slower. Olmo took over the maglia rosa with Guerra 29 seconds back. Guerra’s answer came the very next day during the ninth stage. Over the rugged Adriatic coastal roads he and six others went clear. Olmo was forced to concede 9 minutes 23 seconds and Il Giro had its pink locomotive back with Camusso stalking him at 87 seconds. Luckily Cougnet was close by and interceded. 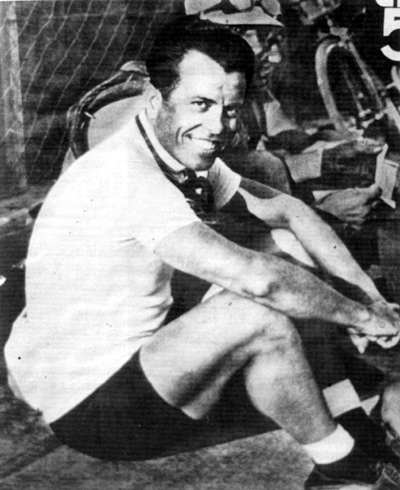 He got Camusso freed with the promise that the 1931 Giro winner would be severely reprimanded. Camusso climbed back onto his bike and rejoined the race. Guerra won the next three stages, the tenth, eleventh and twelfth, but managed to push Camusso back only a minute. After all of his stage winning dominance, he had a lead of only 2 minutes 27 seconds. The thirteenth stage, from Florence to Bologna, went over the Futa and Raticosa passes that separate Tuscany from Emilia-Romagna. Vervaecke was first over the Futa, but he faded badly and eventually lost over twelve minutes. Next, it was Olmo and Camusso who attacked, taking Bertoni and a couple of others but leaving Guerra, who was suffering from stomach problems, far behind. At the bottom of the Futa, Guerra was miserable and losing gobs of time. He felt he had suffered enough and decided to quit the Giro. He climbed into the Maino team car, which then continued motoring down the day’s race route. The Maino car soon met up with the organizer’s follow car containing Cougnet and Colombo. Not wanting to have one of cycling’s greatest stars drop out, they pressed Guerra to get back in the race. Finally giving in to their pleas, he climbed out of the car, got back on his bike and rejoined the race. He hooked up with other riders who had been dropped by the Olmo/Camusso attack and gave serious chase, despite having ridden in the team car for a portion of the route. Olmo beat Camusso to win the stage and five minutes later Guerra led Demuysère over the line. Giro historians look upon this stage and time loss that Guerra suffered with a gimlet eye since he’d been driven for an unknown number of kilometers in the team car, making the whole affair rather messy. But given Guerra’s popularity, Cougnet was loath to penalize or eliminate the much-loved racer. Guerra in the race meant crowds and thousands of copies of La Gazzetta moving off the newsstands. After all, this was a business. Camusso’s efforts allowed him to wear the Pink Jersey while riding the next stage, the second time trial at Bologna. Going in to the time trial he had a 70-second lead over Giovanni Cazzulani and 2 minutes 55 seconds on Guerra. Guerra was considered the best man in the world against the clock and he showed why. Olmo lost 65 seconds and Camusso, who was primarily a climber, was out of his element. The 3 minutes 46 seconds he conceded to Guerra cost him the overall leadership. It was Guerra again in pink with Camusso second at 51 seconds. Olmo won the last two stages, but the race was effectively over after the time trial and it belonged to Guerra. At 32 years old he had finally won a Grand Tour, taking ten stage victories along the way. But, the final gap to Camusso was only 51 seconds, which brings us back to stage thirteen. One can’t help but feel that had the race been properly adjudicated with Guerra either forced to go back to where he climbed into the car (if it came to that he probably would have just quit) or be penalized a reasonable amount of time for riding in the car, Camusso would have and should have won the race. Binda, having come in second in the second stage and third in the third, abandoned during the sixth leg after crashing and getting hit by a police motorcycle. Italian sports fans had a special treat on the Giro’s final day. Just as Olmo won the final stage at the Arena stadium word came over the radio that Angelo Schiavo had scored the World Cup-winning goal in overtime, giving Italy its first soccer world championship.